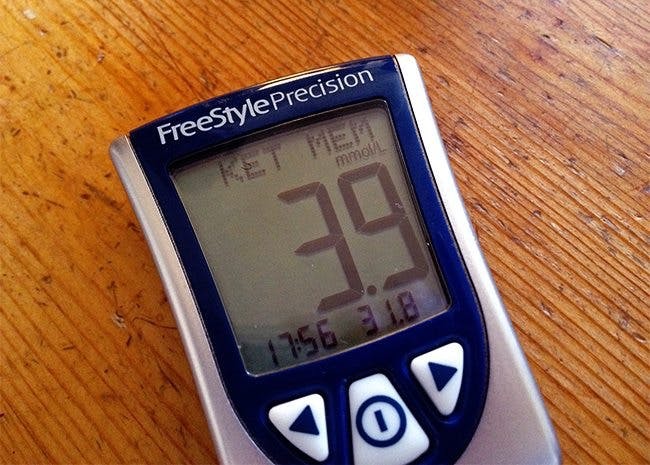 Getting into optimal ketosis (1.5 – 3 mmol/L) was trickier than I thought. After ten days of stricter LCHF than usual I’m still stuck at a mediocre fasting level of 0.7 – 0.8 in the morning. Later in the day the levels are higher, with a record of 2.8. Tonight my brother arrived for a visit. Just for fun I let him test his ketones (see picture). Wow. But perhaps I shouldn’t have been surprised, this guy can eat half an inch of butter on top of a block of cheese for breakfast. The ketone master has arrived. After cycling 50km yesterday in a fasted state, I had coffee & cream.For breakfast afterwards, I ate 2 fried eggs in butter, half an avocado & himalayan salt.I tested ketones etc about 15 mins later.Blood glucose 5.9, ketones as per freestyle meter was 6.4. Not sure why my blood glucose not lower? ( Suspect cream at coffee shop was fake? Dnt taste great! Or coffee unstabilising my blood sugar?) Also is my ketone reading not too high? I have been lchf for 6 years, & at stable weight after losing 15kg in first 8 weeks after starting lchf. Brand new to LCHF. It's been 2 weeks. I'm a 43 year old female with 15 pounds to lose (want to go from 140 to 125). So far, I'm averaging 1,000 cal per day at 80% Fat 13% Protein 7% Carbs. Am I on the right track? I thought we didn't have to worry about calories....but I want to lose weight. I'm so confused! Thanks in advance! I should add to my previous post....my cals are only this low because I'm just not hungry on LCHF. Which is a good thing!!! First time ever in my life I haven't been hungry! Thank you Peter! I just submitted my question. I was reluctant to post there because I haven't seen any replies to previous questions. Maybe I'm just not looking in the right place. Thanks again! I have been doing ketogenic diet for 28 days so far and something changed recently. From the second week, my ketone numbers were 0.5 in the morning and 5.0 in the afternoon-evening all the time. However, recently my afternoon-evening numbers went down to 0.3. But I have been eating the exact the same foods for past 4 weeks (I live and work in my home office so I don't eat out). Why did ketone number go down? I remember reading some article stating that once you are keto-adapted, your ketone number would go down since you are using ketones very fast. Maybe that is the reason why my ketone numbers went down while I've been eating & exercising exactly the same all the time? Where can i buy this device ? A morning fast I'm 2.4 and 20 min. After my big amazing fat and protein dinner I was 1.5. The weight is falling off. And I'm not exaggerating. To be honest. I don't know what a nutritional keytosis would be. This isn't something you do for anything more the kissing weight or you are a Diabetic. They have many keyton maintenance programs. Good luck. You need to test it after a one meal fast and days of strict no more the 20 to 30 carbs high fat and your profited intake should not be more the 10 to 15 grams more then your carb intake. To much protein can have an adverse effect on this diet. Your calories are to low. You should be at 1500 calories 20 to 25 carbs and 30 grams of protein and a min. Of 100 fat grams to get into keytosis. You do this. The weight will fall off you. I lost 10 pounds in 8 days 14 in two weeks and 17 in three. I hope that made sense. 17 in 3 and a half weeks and I have been in a stong state of fat burning keytosis. I check my blood. After a while, the ketones in your blood stream are only from the foods you're eating being converted into ketones; they're not actual fat burning from your body. If you're in nutritional ketosis at all, it should not stay high. If it stays high, you're not burning your own fat. If you're burning your own fat, it will get a bit lower, and level off. Hi! What happens when your ketones exceed 3.0 mmol/L ? Thank You! activity from it) then the cause of your high blood glucose is likely not food related. After 50km bike, you glycogen reserves are depleted. If there is not carbs from food available to replenish. Your body is able to turn fat into glucose, for the sole purpose of topping up glycogen. That happens within 15 minutes after your workout and it takes some time for the glucose to clear you bloodstream (maybe an hour or so).